Where is Benidorm located? Can you show us a good Benidorm map? A question we get a lot from readers of our newsletter. 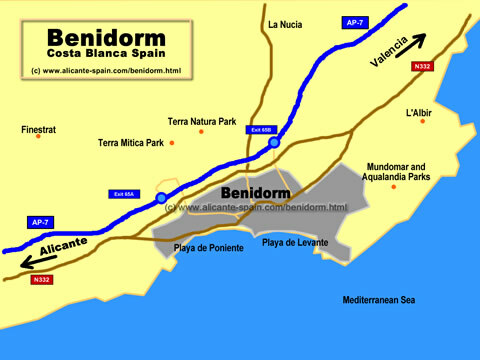 So we put together a couple of Benidorm maps to give you a better understanding on where Benidorm is located. 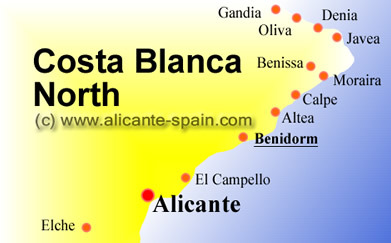 Benidorm lies in between Alicante and Altea. About 45 km northeast of the area capital. Offering a huge selection of attractions and theme parks, Benidorm attracts thousands of people every year. More on Benidorm, including a short Benidorm video, can be found here. As seen on the above Benidorm map , various Natural and Water Parks are located surrounding Benidorm. How far away is Benidorm from … ? What Hotel Would You Recommend? .